GNE Gains for 6th Straight Day, Just the Beginning! Yesterday, Genie Energy (GNE) gained for its 6th straight trading day, closing up by $0.13 to $6.03 per share, but this is just the beginning! 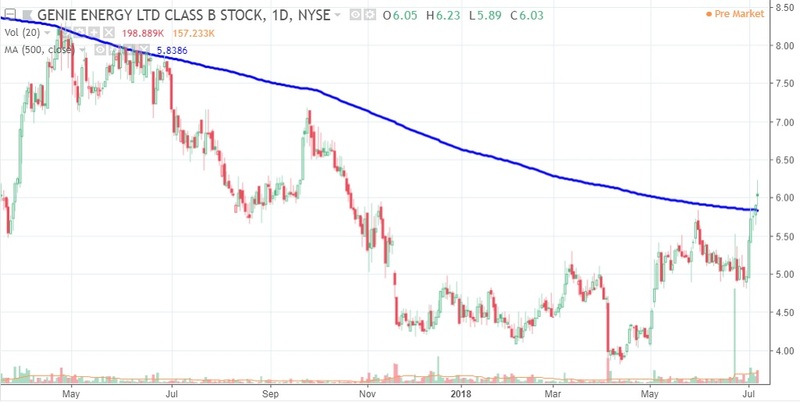 After struggling in 2017 for three straight months to surpass its historically important 500-day moving average resistance level and ultimately failing to break through, GNE in recent days has moved strongly past its key breakout point of $5.84 per share! By surpassing its 500-day moving average with ease after facing such major resistance there in 2017, it proves that all weak hands exited in late-2017/early-2018 when GNE shares experienced a consolidation phase. GNE experienced the same type of consolidation after it failed to break through its 500-day moving average resistance level in September 2014. When GNE returned to its 500-day moving average on April 2, 2015, it surpassed its then key breakout point of $8.69 per share with ease then exploded to a high later that month of $14.25 per share! April 2015 became GNE's largest gaining month in history and history is repeating itself right now in July 2018. We are now only 6 days away from the Trump/Putin summit and investors are about to begin searching like crazy for Syria stock plays. GNE will become discovered in the upcoming days as the only way for stock investors to play the recovery and rebuilding of Syria's economy. Based on GNE's April 2015 rally to a price that was 64% above its 500-day moving average key breakout point, look for GNE to rapidly rise to a price of $9.58 per share over the next 2-3 weeks! Remember, GNE went public in 2011 as a spin-off of IDT. Two years later, IDT spun off another subsidiary called Straight Path Communications (STRP), which began trading in 2013 at a price of $5 per share with a market cap of only $60 million. On April 10, 2017, STRP was already up 598.2% to $34.91 per share when AT&T announced its intention to acquire the company for $1.6 BILLION in cash valuing it at $95.63 per share for a shockingly HUGE premium of 173.93%! STRP rejected the offer and a bidding war ensued between AT&T and Verizon, which caused STRP to gain 572.8% in a single month to a May 10, 2017 record high of $234.89 per share where its market cap surpassed $4 BILLION! At that point, STRP was up by nearly 4,600% from its IDT spin-off price! Ultimately, STRP agreed to be acquired by Verizon for $3.2 BILLION or $184 per share and the deal closed on February 28, 2018! Most GNE shareholders were also STRP shareholders and have just received a total combined payout of $3.2 BILLION in cash that they are looking to reinvest! With crude oil up again this morning and GNE recently reporting 1Q 2018 year-over-year revenue growth of 25%, we look for current GNE shareholders to consider doubling down on their positions in the weeks ahead! Remember, when GNE exploded to a high in April 2015 of $14.25 per share within 19 trading days of surpassing its 500-day moving average key breakout point of $8.69 per share, WTI crude oil at the time was trading for $50 per barrel, but today it is nearly $75 per barrel! We are being extremely conservative by suggesting that a return to $9.58 per share this month is possible! Following the mid-terms when Trump implements sanctions against Iran, crude oil is likely to rise back to $100 per barrel. If so, we fully expect GNE to surpass its record high from December 4, 2013 of $17.80 per share! 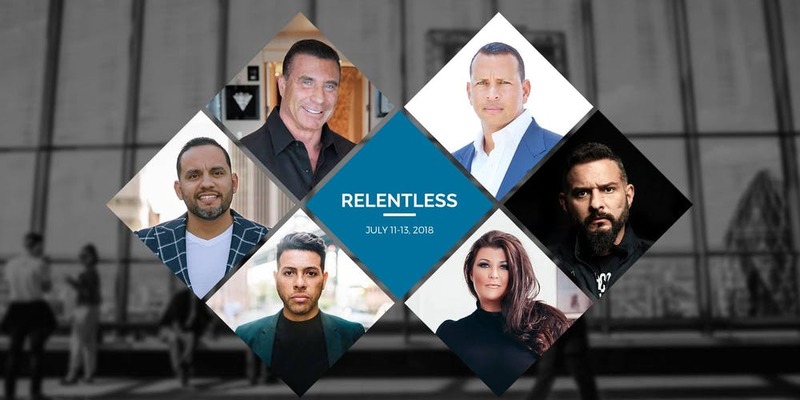 NIA's President Gerard Adams will be a featured speaker tomorrow in Anaheim, CA, at Relentless 2018 along with Yankees World Series Champion ARod. He will without a doubt be telling everyone he meets that GNE is his #1 play in the market today. We strongly suggest for all NIA members to spread word about GNE to any family members you want to make a fortune with you. Make sure they don't forget to thank you later this month!